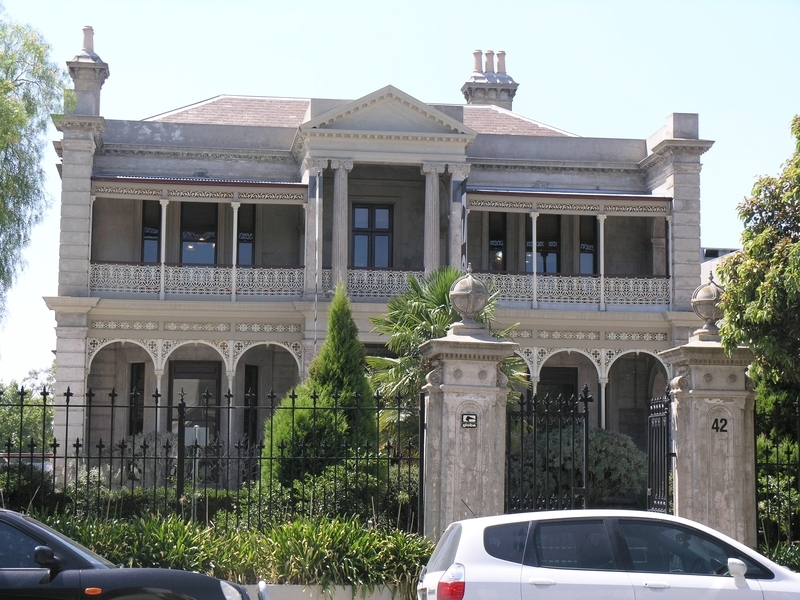 Stanthorpe, (also known as Stafford House, and later the Manse) is a substantial mid-Victorian, residence built for merchant, Andrew Sutherland. Born in Scotland, Sutherland arrived in Melbourne in 1852 aged 33 and became a partner in the prosperous firm of William Nicholson and Company, of Flinders Street. Four years later he purchased a large property in the fashionable and well-connected residential area of St Kilda hill, replacing the existing house with this one in 1874. Dominated by a central pedimented portico and elegant balcony, the rendered two-storey house is undeniably the work of architects, Crouch and Wilson, although documentary proof of their authorship is yet to be found. It is practically a replica of Cleveden next door (demolished), built as an investment by Sutherland. The restrained classicism of Stanthorpe's design extends to the internal features of the generously proportioned main rooms, and arched entrance hall with its Ferguson & Urie stained glass window displaying the Sutherland family crest. 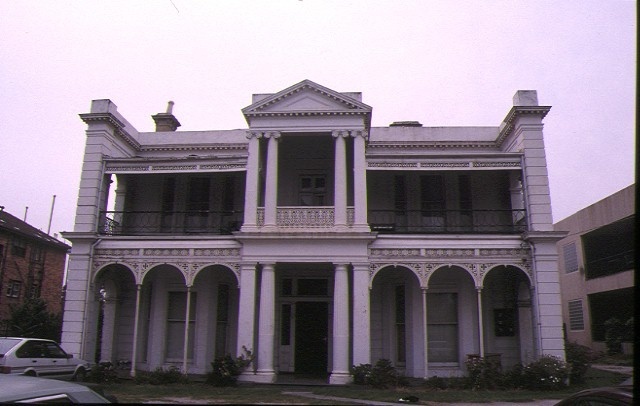 After Sutherland's death, the house remained a focus for Melbourne's influential citizenry, being owned or rented by businessmen and politicians James Patterson, Jonas Levien and Thomas Bent in the 1880s. In 1890 it was purchased by gentleman, Duncan Grant, whose extensions included a billiard room. After ownership by the Presbyterian Church from 1919, the house returned to private hands in 2000. Stanthorpe is of historical, architectural and aesthetic importance to the State of Victoria. Stanthorpe is historically significant for representing a phase in Melbourne's development when St Kilda, particularly, the hill, was a favourite residential location for merchants, politicians, members of the legal profession and other socially aspiring professionals. In particular, Stanthorpe is important for its association with Melbourne merchant Andrew Sutherland, who moved among the elite of Melbourne's business and political society from the 1850s to 1880. The property's association with status and its desirability as a residential address continued under the prominent identities Jonas Levien, Thomas Bent, and long term resident and owner, Duncan Grant whose addition of the billiard room underlines his position as a gentleman of Melbourne. Stanthorpe is architecturally important as an outstanding example of the restrained mid-Victorian classicism of the late 1860s and early 1870s. Stanthorpe is important for its intactness, which is representative of the two main periods of its residential use, with its integrity reflecting the upper middle-class taste of the mid and late Victorian households of Sutherland and Grant. Stanthorpe is aesthetically important for its internal ornamentation, notably the Ferguson & Urie stained glass entrance hall window commissioned by Sutherland for its decorative beauty as well as for its status symbol value. The hall tiles, pilasters, etched-glass windows, plasterwork and mantels contribute to the aesthetic integrity of Stanthorpe's essentially mid-Victorian decorative scheme. 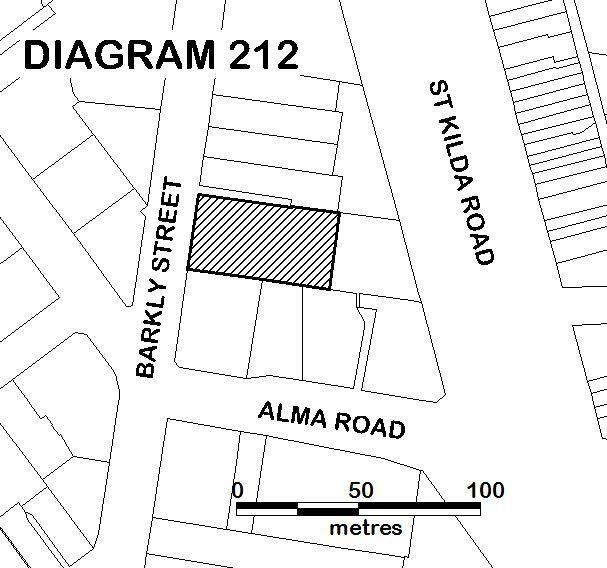 All of the place shown hatched on Diagram 212 encompassing all of Lot 1 on Plan of Subdivision 707532.